I started this blog on 7 April 2009. It may look as a very diverse set of blog-posts, but there is plan behind all this. As a teaser, i am publishing today my Pamphlet. More to follow in the days/weeks to follow. Let me know what you think. – Our worldwide Financial system is going through a “meltdown”. The old game of greed is coming to an end. Trust is becoming value number 1. – The East/West shock: economic powers shifting from the Western world to the new economies of APAC and BRIC+ countries. – New forms of communication via the internet (blogs, wikis, social networks such as Facebook, Twitter, Netlog, etc) propose a new paradigm with respect of privacy. – Barack Obama describes it as the ‘audacity of hope’; innovators, planners, academics and authors are referring to dreamtelligence as a new, vital, and visionary way to use play, fantasy, dream-thinking and innovation to kick-start ideas and stimulate community engagement. – A fantastic call for and revival of authenticity for ourselves and our leaders. Having true leaders: with charisma, attraction, integrity, and authenticity. – Our technological revolution has just started. o Today our technologists are capable of breeding a human ear in their labs. We are now in a position to create and grow cells, tissues and bodies. o Artificial Intelligence is back: by 2030 our computers will be able to think, be self-learning, self-healing , some will be able to have a consciousness. o The emergence of Google and the “Global Brain”. The internet today is already a tremendous source of information. Today’s search experience will pale compared to the mechanisms we’ll have in 20 years. All knowledge will be available anywhere, anytime, wireless, via brain-implants. o Social networking is already revolutionalizing the way people and companies are communicating. Interesting to note that these Technologies let us evolve again from a system-to-system communication towards human-human communication. o Today you can order your personal DNA Gnome sequence in the USA for only 399$. The company doing this is a Google backed start-up. Think DNA in the cloud, with DNA comparisons between ancestors, relationships, etc. o Brain-wave helmets and chip-implants will give humans better sensors. By 2030 we will see the emergence of “superhumans”. In such dramatically changed context, what will make us “human” ? o A lot of these future scenarios are described in Ray Kurzweil’s “Singularity” concept. This is the moment when man and machine will truly blend. Kurzweil claims this will happen around the year 2030. And the pace of all these technological innovations just goes on in a very exponential way. In the next 20 years we will witness technology breakthroughs that will mean the tenfold of what we have seen the last 20 years. Found this link about the Consumer Genetics Show via a tweet from Tom Hague of the Open Calais project. Tom tweets that he never expected to see the words “Genetics”, “Consumer”, and “Show” to come together. Coincidently, at about the same time, i am reading the following paragraph in chapter XV – Time Warp in the book “As the future catches you” by Juan Enriquez. “Nor is it illegal in Singapore, Russia, Brazil, China. “The incentives are too great to stop this from happening. I am a big believer that we will see the biggest breakthroughs and innovations on the cross-roads of ICT and Bio-engineering. And i would like to add one more dimension to it: the Global Brain or the Semantic Web. One of the companies mentioned in the article on the Consumer Genetics Show is 23andMe. Sergey Brin, the billionaire co-founder of Google plans to contribute money and his DNA to a large study intended to reveal the genetic underpinnings of Parkinson’s disease. See also this article in the New Your Times dated March 2009. 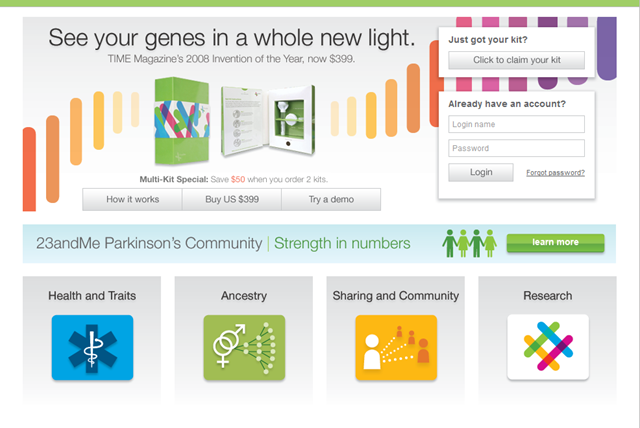 23andMe is co-founded and co-managed by Mr. Brin’s wife, Anne Wojcicki. The company offers a personal genomics service, in which it scans the DNA submitted by its customers and provides information on their health risks, ancestry and other traits. Esther Dyson is a Board member. Start thinking DNA and gnome in the cloud. Have been on the road quite a lot with a bag full of new ideas. In all the discussions, it became clear for me that the end-game is about superior and dramatically better user experience. The end-game is not cloud, the end game is not Web 3.0 or 4.0 for the matter. These are just enablers. The end-game is user experience. And much of that experience will come from Mash-ups, real-time and giving the power for creating in the hands of the end-user. We all have seen the Google map mash-ups with addresses of best bars in town. For sure a life-critical application, but what i have seen the last couple of week is a bit more impressive. I will NOT cover Google Wave announcement, as already all over the place, and this blog is not intended as just an echochamber of other sites. It all started at the iMinds conference some weeks ago, where i saw a presentation by Ben Cerveny from Stamen Design. Ben used to be one of the founders of Flickr. Ben was really mis-casted in a political-themes-debate, but did well anyway. He gave a pitch about the importance of web-literacy of our population, and about identity in a special way. For ex everybody recognizes the New-York skyline. But would you also identify yourself with the traffic visualization map of your own city ? Ben showed some great visualization examples. Have a look at http://delicious.com/benstamen. I most like the swarm example and the cab-spotting. The swarm shows you real-time visualizations of chat/twitters/social media conversations. The cab-spotters is also real-time, and the resulting visualization shows most used street patterns. Thanks to my sponsors, I also was lucky to be able to attend Semantic Web3.0 in NY some weeks ago. Many good stuff, but i would like to share at least 3 examples: Aza Raskin from Mozilla Labs, Dan Willis from Sapient and Alex Karp from Palantir Technologies. Aza Rasking (have a look at his bio on wikipedia, the guy was already a star at the age of 17 😉 is Head of User Experience at Mozilla Labs, and gave a preview of some cool things that will come out of the box in Firefox. And yes, I know IE8 Accelerators can do similar things but not quite yet. Aza gave demo of Ubiquity and TaskFox. Taskfox Prototype from Aza Raskin on Vimeo. Dan Willis from Sapient gave a presentation on what happens when machines talk to machines. He did a great pitch illustrating with some sort of Kindle device with transparent screen capturing signals from semantically enabled objects. I love the very last example about taxis that radiate their traffic violation history. His presentation is on slideshare below, but you should really have heard Dan’s voice-over during the conference which makes it much more lively. View more OpenOffice presentations from Dan Willis. Last one for today comes from Palantir Technologies. At Web3.0, Alex Karp gave an amazing demo about a mortgage fraud investigation system, build as a mash-up of many different data-sources that were exposed with semantic techniques. The point i am trying to make is not that these are cool videos. The point i am making is that all these use the principles of the semantic web (which is essence is about giving meaning to data, meaning that can be exploited via APIs by a computer), ideally run in a cloud (where integration is done these days at data-level), enabling great user experience.